Quick Take: Mogli is a beer for people that love to huff chocolate, but like their beer flavors mellow and drinkable. While I like my chocolate beers rich and full of velvet Elvis, plenty will appreciate the porter first mentality that keeps the traditional elements from being crushed under a choco-lanche. For me, the spectacular nose didn’t quite follow through to the taste, but this is a beer that does its namesake proud. 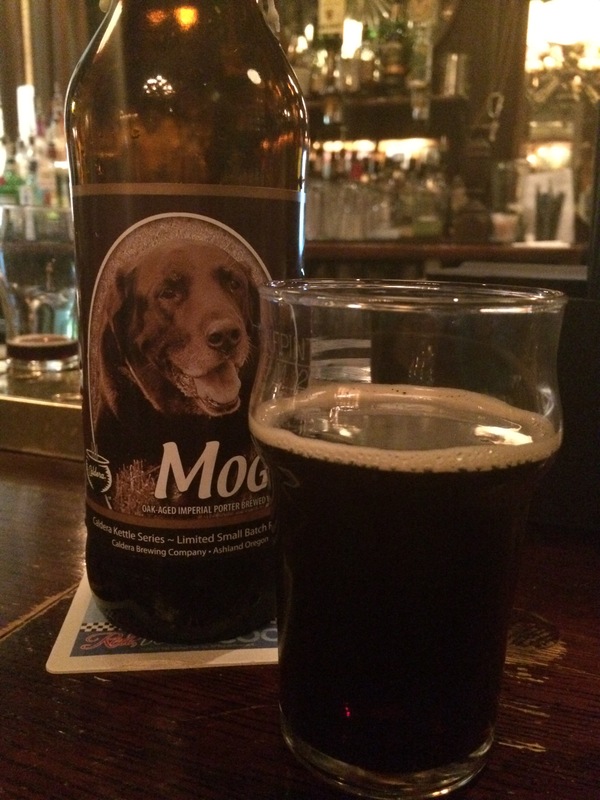 Brew Facts: This was brewed in honor of Mogli, brewer Jim Mill’s chocolate lab that past away. To give the beer its chocolatey quality, Caldera uses pale chocolate malt, chocolate malt, and natural chocolate. Sounds like a good valentine’s gift for that beer loving significant or insignificant other. Appearance: As goes the looks of Mogli’s porter brethern, so goes Mogli. A deep mahogany with hints of ruby red if it catches the light just right. It pours a fluffy head, a finger at best, that thins to a film edged by a large-bubbled hoop. If you’ve seen one porter, imperial or otherwise, you’ve basically seen them all. Nothing remarkable, but no one is buying this just to look at it. Aroma: A sniff and I’m immediately struck by something. That something is probably one of the best chocolate beer aromas has ever seeped into my pores. A fudgy, tootsie roll dipped in chocolate milk sweeps out of the glass in thick waves. Some malt and vanilla blends in with a fist-shaped chocolate bar that pummels the nose. The mantra “no balance, no escape” seems apt here as there is no hope for any other subtleties to come through. The closest to this is probably Southern Tier’s liberally-spelled Choklat, but even that falls under the might of Mogli. That must have been one delicious smelling dog. Freaking phenomenal! Taste/Mouth Feel: With expectations hovering somewhere above the curvature of the earth, I take a sip. The initial mouth feel is thin but malt surges in the middle to add some gravity. This translates to a drinkability that you wouldn’t get if this were a stout. The flavor mixes classic roast and peaty porter qualities with a slab of chocolate in the form of baker’s cocoa rather than rich milk chocolate. At colder temperatures, the chocolate is slightly chalky, but isn’t a turn off. I’d recommend drinking this on the warmer side for a porter to loosen it up and blend it better. A candied sugar sweetness complements the malt to prevent the cocoa from being too bitter. The finish is dark fruits and plum, a mild spicy note, possibly from a touch of alcohol that manages to leak through, and a dry, tongue-lingering burnt/bitter cocoa. In simpler terms, a fruity tang that turns to char. Not much in the form of wood or oak, maybe a hint of vanilla, but the “barrel” here is bourbon-soaked oak spirals. Final Thoughts: Mogli is a beer for people that huff chocolate, but like their beer flavors mellow and drinkable. As it is, without the chocolate, this would be a solid porter with an adequate mouth feel and standout char and dry roast characteristics. With the chocolate sneaking in as almost a background element, Mogli pushes above most other porters and many other chocolate beers. I’ll stick with Southern Tier for my current ultra-chocolate beer needs, especially considering the high cost of Mogli, but I can easily see this on par with Rouge’s Double Chocolate and a cut above Young’s Double Chocolate and Brooklyn’s Black Chocolate Stout. While I like my chocolate beers rich and full of velvet Elvis, plenty will appreciate the porter first mentality that keeps the traditional elements from being crushed under a choco-lanche. For me, the spectacular nose didn’t quite follow through to the taste, but this is a beer that does its namesake proud. Recommendation: Must buy for cocoa and roasty porter lovers. Previous Post Vermont Beer for You!